I can’t say I’m the biggest Bowie fan who ever lived. I love his music, his lyrics, how he transcended popular culture and made it okay ­– cool, even – to be whoever you want to be. But for me, what made him so special and virtually untouchable, was the level of influence he had on so many prolific pop stars and rock ‘n’ rollers who came after him. Which makes his contribution to music so far reaching he could almost touch Mars. From Boy George and Madonna to Marilyn Manson and Arcade Fire, the diversity among the artists who cite Bowie as an inspiration speaks volumes for his body of work; a catalogue of timeless music that exists without boundaries or limits. When Bowie first hit the scene, rock ‘n’ roll was a macho, predominantly male affair. Enter Ziggy Stardust, who dazzled the world while blurring gender lines and leaving a trail of glitter in his wake. He made it acceptable for male artists to explore their art form outside the confines of masculinity. My favorite frontman of all time, the late Scott Weiland, clearly emulated Bowie on stage. From his outlandish costumes and stage antics right down to his smudgy eyeliner. When news of Bowie’s death hit, I did what just about everyone on the planet did. I binged on his music all day and looked for a way to pay tribute. Which, in Los Angeles, meant heading to Hollywood to light a candle and pour one out for our fallen starman. His star on the Walk of Fame brought mourners in droves, huddled in a circle singing and crying, obstructing the manic foot traffic of Hollywood Boulevard. 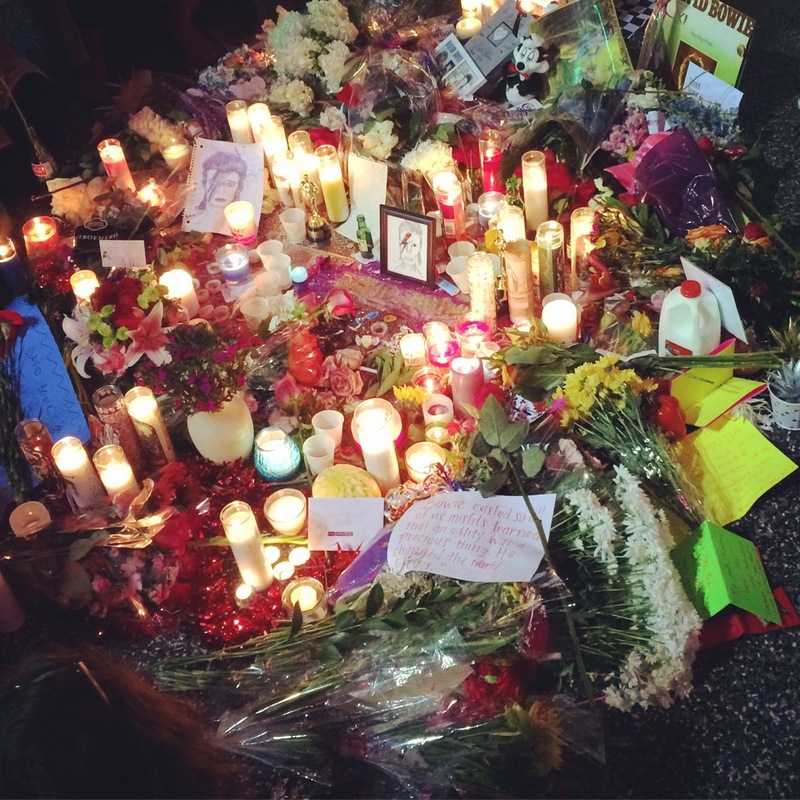 I was stopped by a KTLA reporter and ended up on the evening news, inarticulately trying to paraphrase some of the sentiment I saw written in poems and letters across the makeshift shrine. Afterwards, I ventured to Amoeba Music to sign a mural of messages from fans, buy a vintage concert shirt and eavesdrop on all the stories swirling around me. Favorite Bowie moments shared among strangers. More than a musician, performance artist, otherworldly androgynous alien being or whatever else he may have meant to his fans, he was a symbol of inclusiveness just as much as he represented rebellion. Which, I think, is why we’ll always cherish him.